The Société de développement Angus aims to promote dynamic cohabitation of living environments and work spaces to have a site that is full of life and accessible for families with affordable housing in the heart of Montreal. 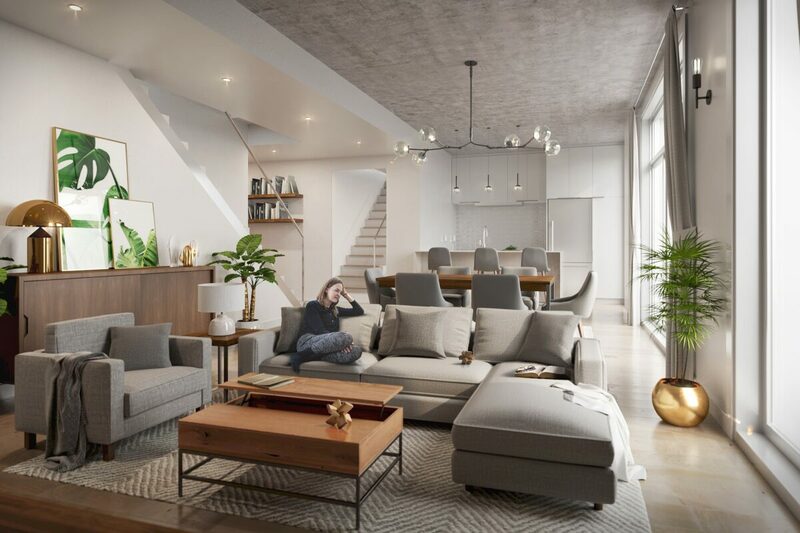 The Cité Angus offers 120 spacious, modern condominiums and townhouses in the heart of this innovative ecological district, all of which have been adapted to meet the needs of modern families. Designed by the architects at Rayside Labossière, the Cité Angus boasts modern units around a large courtyard where children can play safely. With its bright shared family space, accessible to all co-owners, storage space for bicycles and strollers, and its bicycle repair station, the yard is really an extension of your home. Located in the eco-district of the Technopôle Angus, owners will enjoy 25% public and green spaces, a pedestrian walkway, an urban woodland, four ecological paths that promote biodiversity along with two public squares, lined with local businesses. No wonder that already more than 85% of the units are reserved! Fortunately for you, it is always possible to get hold of a unit. The units still available are spacious and enjoy a prime location in the building.